In Part 1, I shared with you how I went from knowing natural body odour surrounding me as the status quo to making acquaintance with the world of Chanel No.5. So, this part is about my entry into the world of perfumes and finding my own. After finishing my management studies in Bajaj, I came to Portland State University to do my second MBA. Starting as a Research Assistant gave me $335 a month and a freedom to explore luxuries like perfume. 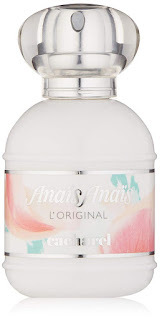 The first stop was at Anais Anais. Like Chanel, it was French, but much more affordable. I loved a slight spray of the flowery fragrance on my skin and used it sparingly on that occasional date that I went on. In all my departmental store perfume adventures, I learnt of a well known fact that remains a magical feature to me. Which is that each perfume smells differently on different skins. The same perfume may smell great on my friend and lousy on me. There are flowery perfumes that accentuate the feminine in you, there are the musky ones that bring out the sensuality in you and then there are the strong ones that smell a mile away announcing your arrival. You know a great perfume that’s right for you when you meet one. A full time job at Intel game me more financial freedom expanding my perfume collection. Anais Anais was followed by “Pleasures”. I loved it’s youthful, flowery fragrance. At the time of my punk haircut cut, mini skirt, black stockings, pierced nose era, the perfume seem perfect. During those adventurous years when I would go off on a week-long trek or river rafting or return from a long run or a hike, the scent soothed my stinky skin and made my re-entry into the real world from the weekend escapades. It gave me company on my many dates, often ending in heart ache but always starting with hope and smelling good. Over all these years, my hair got longer, skirt length came below the knee and my perfume experimentation expanded. There was Dune, Obsession and plethora of perfumes that paraded. I tried many with no real affinity to any one brand. It was a habit and not a special focus item. Be it a visit to Macys or Nordstrom to pick up a bag full of clothes or taste food from different restaurants with friends or drink the best wines – it was a life of convenience and comfort and all those things that were once unattainable became routine. My long adventurous single life came to a halt when I married Rajat. We moved in together to make our home in Milpitas, CA. I ended my gypsy life style and moved into a very organized home with my 10 cushions, one futon and 1,000 books. The marriage was followed by gifting. Whenever Rajat went on a trip, he brought me back something beautiful – a pearl necklace, a pair of earrings and once, a perfume. I always felt perfume was a very personal purchase. I usually never gave it as a gift (except the ones I would take to India, often from Avon where I worked as a door to door sales woman) nor did I receive it as a gift. When I opened the deep golden mustard box with blue lettering “Poeme” the golden liquid in a beautifully shaped bottle stole my heart the second I sprayed it on my skin. It was as though it belonged. The next day at work, people commented saying that I really smelt good. There was something about this perfume that paired perfectly with my skin. 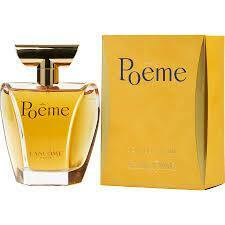 I got “Poeme” as a gift in probably in 1996 and I stayed faithful to it. My friends who would meet me years later would say that I still smelt the same and would ask me if I still used Poeme. They say that the strongest memory of people is by their smell and I wondered if my scent was completely intertwined with “Poeme”. And then, something happened that forced me to prepare to bid farewell to my favorite perfume.